Hello to everyone on the website. Spring is here, and with it all the plans for a great summer and fall. There is a lot happening and much to share with all of you. I have been under the weather for the last couple of months, and I am recovering quite well. During my illness Susana took over my classes, and everyone has loved her, they can’t get enough of her. Last week I taught a couple of classes, and they went very well. Susana and I will alternate until my energy returns, and that looks like it will be very soon. 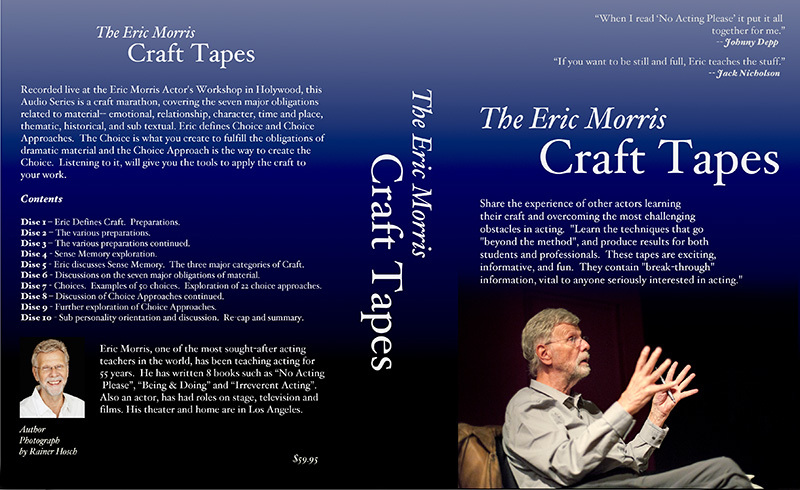 We have received many orders for “The Craft of Acting Tapes” which come in a package of ten CD’s that cover almost the entire craft process. If you missed ordering them, or have decided to get them now, here is how: Contact Pam Forbes, our executive administrator, at ermorasst@hotmail.com. During the period of my recovery, I have been doing some writing on my next book “A Second Chance at Life.” It should be finished sometime early next year. Susana is also working on her book “The Universe Within.” Whoever finishes first will buy the champagne. It seems like this year is turning out to be a very busy one for us. We are scheduled to do a week long Intensive class in Madrid, Spain in early July. The Major Jamboree is scheduled from June 12th through the 17th at the UCLA Conference Center in Lake Arrowhead. Six days and five nights of incredible work! The Major Jamboree is the premier event of the year. Besides taking place in paradise, the accommodations are five star, and the environment is to die for. We teach twelve to fifteen hours every day. We do instrumental liberation work, scenes, and monologues that we specially assign to you. People leave the Jamboree feeling three feet off the ground. Do not hesitate to join us, jump in! We are working towards doing more videos to add to the website. It should happen in the near future. The Turks have decided to republish two of my books, “No Acting Please” and “Irreverent Acting,” and they will be translated into Turkish with a different publisher. All eight of my books are on eBooks Kindle Amazon.com. Quite a number of our people are working or preparing to do so. Angie Cepeda who has been with us for over a decade is working in a show in Colombia. Angie is not only beautiful but incredibly talented, and does a lot of work in the industry. She has starred in two films back to back with Robert Duvall, and has had a recurring role on “Jane The Virgin.” John Nicholson, a long time student of ours has booked a leading role as a detective in a new show. We will tell you all about it in the upcoming months. Nathan Grubbs and Marc Senter formed a company a while back, and are in preparation to do their first film “Nola” which has been totally financed. They are in the process of the selection of the director. Intensive 2015 graduated at the beginning of March. We are so incredibly proud of the work done… truly superior work! Our warmest, and deeply heart felt congrats to each one of them and their families for their unwavering support. Let’s make each day a truly productive, creative, and precious one! We wish you all health, happiness, and love in this fresh month of April.